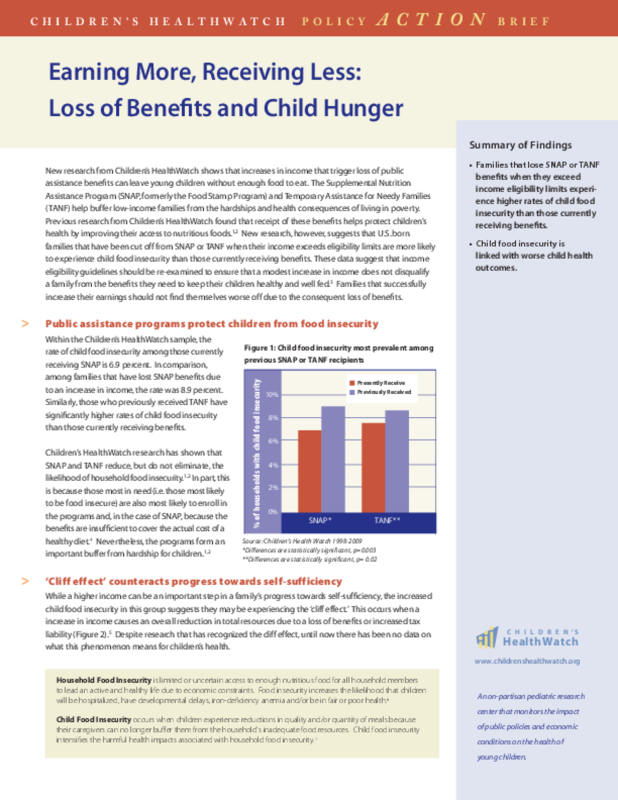 New research from Children's HealthWatch shows that increases in income that trigger loss of public assistance benefits can leave young children without enough food to eat. Families hat have been cut off from SNAP or TANF when their income exceeds eligibility limits are more likely to experience levels of food insecurity that require reducing the size or frequency of children's meals compared to those currently receiving benefits. Previous research has demonstrated that both SNAP and TANF reduce the likelihood of food insecurity. Income eligibility guidelines should be re-examined to ensure that a modest increase in income does not disqulaify a family from the benefits they need to keep their children healthy and well-fed. Families that successfully increase their earnings should not find themselves worse off due to a resulting loss of benefits.